Lest readers feel daunted by the length of this review and give up before the end, I’ll do the summary now. This set of sixteen CDs presents, in chronological order of composition, fifty-two twentieth-century works, each by a different composer, in performances drawn from the EMI catalogue. At a little more than £2 per disc, the expression “Bargain of the Month” is quite inadequate to describe it, and if you think you might be part of the target audience you should snap it up before it disappears for ever. I wonder who the target audience is, though. Someone like me, perhaps, a long-standing collector of music of the twentieth century? Forty-one of these works already feature in my collection, thirteen of them in the same performances as here, leaving thirty-nine discoveries, either of the music or of the performance. Duplications are untidy and irritating, though, and taking couplings into account, this box will enable me to remove only one CD from my shelves, Carmina Burana. A beginner will certainly find it an excellent way to start exploring the music of the twentieth century, but might he not be reluctant to carry on investing in EMI recordings when he wants to explore further but finds all too frequently that he already has on disc one or two of the performances on whatever CD he is interested in buying? 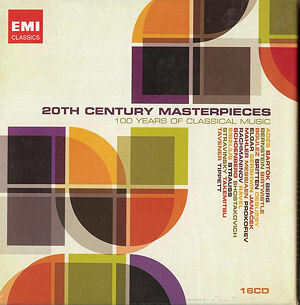 And then there is the title, Twentieth-Century Masterpieces. Everyone has his own definition of a what constitutes a ‘masterpiece’, and I don’t agree with all the choices. In a few cases – Vaughan Williams and Ravel, for instance – I should have preferred the composer to have been represented by other works. That said, the compilers must have had a headache or two, and I have nothing but admiration for them. The discs are presented in slipcases contained in a sturdy enough outer cardboard box. The booklet contains full recording details and an article by Malcolm Hayes in which he briefly presents the main trends of the musical century whilst reserving a word or two for almost every work. As a final observation, I note that there is very little vocal or chamber music included, and no opera at all, so the word “Orchestral” might have featured in the title. To the works and performances themselves: a roar of approval – complete with the obligatory Phantom Bravo Shouter – greets the final chords of Rachmaninov’s C minor concerto, recorded live in Berlin in 2005. I think I should probably have joined in had I been present in the hall, but for repeated listening I’m not so sure, as I have rarely heard a performance as hard-driven as this one. The music rarely subsides into repose in the first movement and many of the more lyrical passages tend to pass by unnoticed. Even the slow movement has a certain febrility about it, and the finale sounds angry, anything but scherzando - playfully, the composer’s indication. Andsnes is technically superb as is the orchestral playing, but I do feel these performers sometimes miss the point. Not so Carlo Maria Giulini with the Philharmonia from 1962 in one of my favourite performances of La Mer. This is a reading stronger than most on local colour, though the conductor’s vision and control of pace ensures also a superbly unified structure. Only in the finale might some think that the wind takes a bit of time to blow up, particularly in comparison with Haitink’s classic reading. But this does not detract from what Wilfrid Mellers called “one of the most thrilling climaxes in the orchestral repertoire”, and only one or two strange balances betray the date of the superb recording. Delius is not my favourite composer, nor is Brigg Fair my favourite Delius work, but Beecham is incomparable here, his reading a model of how to control the ebb and flow so that the music never becomes bogged down. Klemperer’s reading of Das Lied von der Erde will always be amongst the very finest and Christa Ludwig is in glorious voice and profoundly moving in the Abschied. The decision not to include the whole work, however, is wrongheaded and the only serious flaw in this collection. Schoenberg’s Op. 16 pieces are almost contemporary with Das Lied, but their expressionism – Malcolm Hayes uses the word “unhinged” – sets them apart rather. The two slower pieces wouldn’t frighten any horses, but the others still have enormous power to shock, even in performances such as these from Rattle and his Birmingham forces which, in the modern way, actively promote beauty of sound. The orchestra plays with ferocious virtuosity, but there is mellowness too, giving a more comprehensive view of the music than that we find in earlier performances such as Kubelik’s superb reading from 1953 with the Chicago Symphony Orchestra on Mercury. Rattle’s approach to Webern is similar – both works were first issued on the same disc in 1989 – and these performances too are wholly successful. Surely no one could refute the beauty here, the music so fragile, its colours barely touched in, yet with that sure sense of drama and narrative which ensures that this music could exist in this form and no other. Prokofiev comes next, with his Piano Concerto No. 1, completed in 1912 when he was only twenty-one. It is dramatic and turbulent, though less extreme than certain other works of his enfant terrible period, and with the passage of time the world of Rachmaninov might not seem quite so distant as Prokofiev himself apparently wished. In three short, thematically linked movements, the work is an astonishing masterpiece for so young a composer, and Martha Argerich’s performance is stunning. No collection of this kind would be complete without The Rite of Spring. The scandal surrounding its first performance would probably be enough to secure some kind of reputation, and nothing like it had been heard before. What is surprising, though, is how little direct influence can be traced in subsequent music. Not even Stravinsky composed another Rite, preferring to move away in quite another stylistic direction. I had never heard Mackerras’s reading before and it is formidable. Part 1 features fearsome crescendi and rapid tempi, and the orchestra responds with playing of remarkable virtuosity. Part 2 takes a little more time to work itself up to white heat, but it gets there. Mackerras’s control of texture and balance is masterly, and overall this is a reading of enormous stature, at least the equal of Colin Davis’s magnificent Concertgebouw performance from 1976, and certainly superior to that of the composer, for which I’ve never been able to understand the widespread adulation. One of the positive effects of the year of celebration of the life of Ralph Vaughan Williams in 2008, and in particular the two films which were made about him, was the comprehensive debunking of the idea of the composer as a kind of favourite uncle, gentleman farmer, knocking out pastoral idylls in his spare time. So I’m a little disappointed that the compilers have chosen to represent him here by what is perhaps his most pastoral, and possibly his most popular, work. It’s easy to listen to The Lark Ascending and not get past the image of the bird high above the cornfields. It’s important to try, however, and a good way to start is by reading the Meredith poem which was the composer’s own point of departure. And then listen again. I don’t side with the view that, contrary to its surface appeal, everything in Vaughan Williams is dark and gloomy. But this music expresses a passion, a kind of rapture, which has little to do with landscape painting. It is a work of quite extraordinary beauty, and this performance of it a remarkable one, not least because the soloist was just fourteen when she recorded it. Her tone is glorious, her intonation flawless, and though she perhaps misses something of the poise of Hugh Bean’s classic reading – how could it be otherwise? – the way she controls the long, final solo is nothing short of masterly. One year separates The Rite from The Lark. Could two, almost contemporary works be more different? The remaining work on this third CD is different again, underlining the extraordinary breadth and richness of twentieth-century music. Paavo Berglund’s Helsinki performance of Sibelius’s Fifth Symphony was new to me. The opening is brisk rather than spacious, a characteristic both of the reading as a whole and of this conductor in general. The music is already moving forward when the crucial transition between the two first (fused) movements begins, so the uncanny feeling of one kind of music being transformed into another is only just present. The scherzo is exciting, however, and Berglund seems to want to bring out the repeated figuration in the strings which is such a feature of the entire score. The slow movement is also quite fast, though it’s important to note that the composer marks this in his tempo indication. All the same, there is little sense of the kind of calm here that Karajan, for example, in his earlier DG reading, so memorably produced. The finale is superb, with wonderful double basses underpinning the swinging horn theme and an undeniably powerful coda, even if, like virtually every conductor, Simon Rattle being an honourable exception, he shortens the silences in the series of fortissimo chords which close the work. So if this reading goes slightly against the grain of the accepted view and would not be my first choice – Rattle (either of his EMI versions), Karajan (DG) or Herbert Blomstedt on Decca reign supreme – it is nonetheless a striking performance, beautifully played and recorded. Gonzalo Soriano’s performance of Nights in the Gardens of Spain is just right. His tone as recorded here is sharp and brittle, and he plays with a rhythmic freedom which is totally convincing. Whether one would choose this performance over Alicia de Larrocha’s reading of twenty years later would probably come down to recording quality plus the rather more refined – if less idiomatic – playing of the London Philharmonic Orchestra in the later performance. Not having heard the work for many years, I was surprised to be reminded how fine and individual it is. I can’t imagine many people arguing about the status of The Planets. Holst was rather taken aback by the success of this work, and intimidated by his audience’s expectations thereafter. The opulence and colour were replaced, in the years which followed, by something cooler and more ascetic. I wonder how many young people have been turned on to classical music by The Planets? It was certainly one of the decisive works for this particular listener. Even then, though, I was puzzled by Holst’s idea of jollity, and Saturn bored me to death, whereas now, more than forty years later, I believe “the bringer of Old Age” to be the finest and most beautiful of the seven movements. Enough said, except to add that it was the composer’s favourite too. Adrian Boult it was who, in the composer’s words, “first caused the Planets to shine in public” and his 1978 performance – his fifth recording of the work – is definitive. You won’t hear a finer control of pulse and tension, nor better managed crescrendi and climaxes than in this particular Mars. The same rhythmic mastery is evident in Uranus, and that of atmosphere and texture in the distant, unpeopled landscape of Neptune, so close to the world of the Sixth Symphony finale of Holst’s close friend Vaughan Williams. Boult presses on with the big tune in Jupiter, quite avoiding any risk of pseudo-patriotic solemnity, but one wonders, even so, what that admittedly wonderful melody is doing there. Sir Adrian was almost ninety when he set down his final recording of The Planets. Jacqueline du Pré was twenty when she recorded Elgar’s Cello Concerto for the first time, and it has appeared in many different couplings since it was first issued on LP opposite Janet Baker’s glorious performance of the Sea Pictures. Du Pré squeezes every last drop of emotion from this heart-rending music, perhaps even more than it needs. The passage of time, and other, cooler performances, have dampened a little of the adulation this performance engenders, but it is, and probably always will be, a classic of the gramophone. Barbirolli accompanies his young soloist with the utmost sensitivity. Given the presence of the Danish Radio Symphony Orchestra with Blomstedt on the rostrum, I expected to enjoy the performance of Nielsen’s Fifth more than I did. The recorded sound is partly to blame: the balance is unnatural much of the time, with the winds too prominent, especially in the opening minutes. Nor do I feel much in the way of expectant tension in these first pages. The brass playing at forte or above seems harsh and unrefined, and the famous passage for side drum is not very convincing. The instrument stands no chance of disrupting the work, so backwardly is it placed, and compared to others – I’m thinking of Alfred Dukes’ startling, rim-shot-ridden performance on the old Horenstein/Unicorn performance – the player seems to lack ambition! I went back to Myung-Whun Chung on BIS and found it to be at once more dramatic and more finely controlled. In a collection such as this, some performances are bound to please more than others, but I was particularly disappointed since I believe Nielsen’s Fifth to be one of the very finest works of the twentieth century, probably better, as Robert Layton once wrote, than it can be played. Pacific 231 is perhaps a more dubious presence in the masterpiece stable, but there can be no denying the composer’s virtuosity in evoking the great locomotive in sound, and this performance from Oslo is cracker. I feel pretty much the same about La Création du Monde, Milhaud’s jazz-inspired ballet written after a trip to the United States where the composer heard real jazz for the first time. The work is undeniably striking, and the seventeen Parisian instrumentalists play with tremendous precision and real swing under the famous American. Respighi’s Pines are sumptuous and colourful and receive a sumptuous and colourful performance here from the London Symphony Orchestra under Gardelli. Previn’s 1971 performance of Rhapsody in Blue has always been preferred to his later Pittsburgh account, as it also has to many other versions. It’s clearly a fine performance, the orchestral playing hot in the fast passages and tremendously sonorous and romantic in the slower ones. The work itself does little for me, however, and these four works are perhaps better seen as representing certain aspects of twentieth-century music than as masterpieces. I’m always surprised, when talking to music-loving friends, how few of them have made it into Janáček’s music. The Sinfonietta, composed, like most of his finest works, in the composer’s old age, makes a perfect starting point. The orchestra deployed is huge, including nine extra trumpets which feature in the opening and closing fanfares. Each of the five movements contains music of striking originality, and the scoring is unconventional to say the least. Charles Mackerras was closely associated with the revival of interest in Janáček’s music in the 1960s and this performance, released originally on a Pye Golden Guinea LP, is the earliest of several recordings he has made of the work. It is a revelation. Compared to his more recent performances the slower passages are more euphonious and romantic, a matter of orchestral balance and management of tempo. Nowadays he is more uncompromising. Even so I have never heard the return of the fanfares towards the end of the finale as exciting as this. The balance between the brass and the string trills is exemplary and revelatory, all caught in sound remarkable for the period. I imagine the Pro Arte Orchestra was assembled specially for the project. They play like heroes. On to Bolero, and a performance disappointingly predictable. The opening flute solo is so languorous that it might be Debussy’s faun wandering in, and the sound of the rest of the woodwind section seems remarkably undifferentiated. The reading doesn’t grow, and there is no shock when the music changes key for six bars just before the end. One longs for something less refined and plush. I wondered if the suave Philadelphia players might not fall into the same trap in Hindemith, but Sawallisch transforms them into a German orchestra in a reading which is a total success. The symphony based on music from the opera Mathis de Maler is a most satisfying work. The first movement contains a fair amount of that busy counterpoint so typical of the composer. There is then a short slow movement before the imposing finale which closes with a series of sonorous, brass Hallelujahs. I doubt if there is a finer performance available on record than this one. Frank Peter Zimmermann’s performance of Berg’s Violin Concerto is also extremely fine, and benefits from a recording clear enough – and a conductor skilful enough – to allow every strand of Berg’s meticulous orchestration to be heard. If one or two passages can seem a little hurried it is part of an overall view of the work seemingly designed to avoid any suggestion of the saccharine overload to which it is sometimes subject. An interesting point, and one in the reading’s favour, in my view, is that in the long accompanied cadenza which forms the first part of the second movement, the soloist at one point takes the alternative version. I don’t imagine for one minute that he does this because it is easier to play, though it undoubtedly is. No, in avoiding this passage of multiple stopping he plays instead in duet with the principal orchestral viola, and the effect is far sweeter and more tender than the original version. The reading overall is a touch clinical, though, and ultimately less moving than either of my two favourite versions. These both come from the late 1960s, perhaps because I’ve been so satisfied with them that I’ve not needed to look elsewhere. I don’t think anyone could be less than satisfied with either Grumiaux (Philips) or Suk (Supraphon). Mariss Jansons conducts an outstanding performance of Shostakovich’s Fifth with, rather unexpectedly, the Vienna Philharmonic Orchestra. The immense richness of this orchestra’s string section pays dividends in the more passionate or lyrical passages of the work, but no one should fear there over ripeness. I don’t think the four unison horns which launch the faster section of the first movement have ever sounded so baleful as here, and the scherzo certainly doesn’t want for irony. Then the relentless, heavy emptiness of the final pages leaves no doubt that this magnificent Estonian conductor comes down firmly on the side of the argument which says that the close of the symphony is a parody of triumph and not the real thing. I seem to hear someone cough at one point, which made me wonder if this was a live recording. If so, that may account for the unfailing grasp the performance has on the listener, the symphony viewed, as it were, in a single sweep from that famously arresting opening to that hopeless final unison. Another arresting opening is that of Poulenc’s Organ Concerto, and what follows adds up to a most satisfying work. The organ’s characteristic ability to hold long values – frequently against rapid and varied string textures – is brilliantly exploited in this most imaginative work, and the drama, from that opening towards the much more pensive close – if one excludes the closing gesture – is perfectly managed by this frequently challenging composer. Gillian Weir’s performance is masterly, the Festival Hall instrument, and indeed the hall itself perfectly suited to this least ecclesiastical of organ works. The orchestral support is perfectly judged by the late Richard Hickox. Rafael Frühbeck de Burgos’s reading of Orff’s ubiquitous choral work was a natural choice for this collection, even if EMI have countless other, very fine versions in their catalogue. The choral and orchestral contributions are superb, and the soloists are quite outstanding, certainly amongst the best on disc, with, in particular, a serene and golden-voiced soprano in Lucia Popp. The conductor sometimes over-emphasises, with some tempo variations rather exaggerated in a work which hardly needs any help in this direction. This is, though, an excellent reading of this popular work. The disc is rounded off by another work which pops up regularly, but it will be no less welcome for that. Barber’s Adagio is a beautiful piece and this reading by Michael Tilson Thomas is as affecting as any I have heard whilst at the same time avoiding unnecessary exaggeration. Rodrigo’s famous concerto is melodious and memorable, which two reasons are perhaps good enough in themselves for its inclusion here. Previn’s accompaniment is superbly pointed, the woodwind playing in particular full of character, and Angel Romero’s playing of the solo part cannot be faulted. His rhythmic freedom in the slow movement is, as expected, totally convincing and authentic, and his virtuosity in the cadenza-like passages of the same movement beyond reproach. Given the near-impossibility of balancing this work correctly the engineers have done a good job, only rarely making obvious the artificial boosting of the solo instrument. Benjamin Britten is represented in this collection by his Sinfonia da Requiem, composed in 1940 to a commission from the British Council to celebrate a historic occasion concerning “a foreign power”. This turned out to be Japan, and given that each of the three linked movements carries the title of a section of the Requiem Mass, the work was eventually rejected because of its Christian theme. It is dedicated to the memory of the composer’s parents. We tend to forget now how shocking some of Britten’s early music was, and even if we now find the explosive splintering of the music at the climax of the scherzo somewhat crude, there can be no denying its brilliance. The mature composer wrote nothing as romantic as the string climax of the final movement, moving and beautiful though it is, though he kept faith with the work, as his 1965 recorded performance for Decca, still the finest available, demonstrates well. This one from Simon Rattle is also very fine and if it serves to encourage listeners to explore further afield in the composer’s output, well and good. Copland’s Fanfare for the Common Man, well enough played but recorded in a rather dry acoustic, and two excerpts from Khachaturian’s incidental music to Lermontov’s play Masquerade seem inconsequential, even pointless, inclusions in this company, especially followed as they are by Martha Argerich’s outstanding performance of Bartók’s Piano Concerto No. 3. This was Bartók’s last completed work and far from his finest. It’s not only the undemanding language which disappoints, but also the fact that the composer seems only partially engaged with his material, so that much of it seems uninspired to start with and is subject to rather half-hearted treatment. This comment, though, is made in the full acknowledgement that second-rate Bartók is better than much first-rate material from so many other composers. Argerich and Dutoit are a perfect team and bring out the very best in the work. The celebrated Four Last Songs also represent the last completed work of Richard Strauss. Nina Stemme has some fearsome antecedents here: Schwarzkopf made two recordings, and opinion is divided as to which is the finer; then there is Jessye Norman’s wonderful performance with Kurt Masur; and a personal favourite is Felicity Lott on Chandos with Neeme Järvi. But Nina Stemme’s performance was very well received when it was first released, and one can easily see why. Hers is a reading more dramatic, perhaps less valedictory, than most, passion to the fore rather than melancholy. She is superbly supported by Pappano and the orchestra, and indeed the feel of the reading never lets the listener forget that Strauss was, perhaps above all, an opera composer. There is some confusion surrounding the performance of Tippett’s Fantasia Concertante on a Theme of Corelli. The booklet states that it is conducted by Rudolf Barshai, but in fact it conducted by the composer with none other than Yehudi Menuhin and Robert Masters playing the solo parts. Even so, the performance is disappointing. The orchestra is cautious, the players seemingly feeling their way. Recent accounts, notably another conducted by the composer on a Virgin Classics disc, have been more successful at unravelling the complex strands of this ravishing music. Too often important voices are covered here by subsidiary material, giving only a partial view of the work which, sadly, might discourage newcomers from venturing further. There are some rather unlovely sounds from the strings, too, and a two-dimensional recording of which the master tape seems to be in fairly poor condition. Lutosławski’s Concerto for Orchestra dates from the period when official constraints were in the process of being lifted, leaving him to compose freely as he wished. It is one of his most frequently performed works, as well as one of the most accessible, the two things no doubt going together. It is a dramatic work in three movements, the composer incorporating elements of Polish folk music as well as the influence of his compatriot, Bartók, without ever losing his own identity. The scoring is of virtuoso brilliance, and only in the certain passages in the finale does one suspect a little note spinning. Lutosławski was a fine conductor – I have vivid memories of seeing him conduct in London – and this is as fine a performance as you could wish for. He is totally in control of the work’s dramatic pacing, so that the end, when it comes, seems inevitable. The recording tends to harshness and overloads a little at climaxes and in the extreme bass, but it’s an acceptable price to pay for such an authoritative performance. The twelfth disc in this collection is a real mixed bag, an excellent demonstration of the extraordinary range of styles which constitute twentieth-century music. Walton’s Cello Concerto, the third of his concertos for string instruments, is one of his most melancholy works. It was composed for and dedicated to Gregor Piatigorsky, whose world premiere recording with Charles Munch and the Boston Symphony Orchestra is available on a superb RCA Living Stereo SACD (82876 66375 2) coupled with the Dvořák concerto. This performance by Lynn Harrell is superb in every way, though I was struck by the slow tempo of the opening movement, even if this has now become the fashion in performances of this work. The composer marks it Moderato, with a metronome mark of 66-69, and though this can only be seen as an indication, it is significantly slower than that here, and, more importantly, seems slow, and not at all Moderato. Piatigorsky takes 8:13 over this movement, whereas Harrell and Rattle’s 9:00. This may not bother everyone as much as it bothers me, but Walton’s music invariably needs to be kept moving, the affectionate approach, looking for beautiful and interesting byways, a rather dangerous tendency. In other respects this is a superb performance, both from soloist and orchestra, in particular perhaps in the rather episodic finale which is difficult to bring off convincingly. Harrell often seems a bit too ready to mark up the dynamics a notch or two, thus missing something of the fragility of Walton’s music. Piatigorsky, too, is robust rather than tender, and a middle way, both in this respect and in terms of temps, can be found in Yo Yo Ma’s superb performance with Previn on CBS, released in 1985 and one of the first CDs I ever bought. To pass from Walton to Pierre Boulez is to experience a real culture shock! The eight-minute cantata, Le Soleil des eaux, on a typically impenetrable text by René Char, is made up of two movements. In the first, the soprano soloist indulges in what amount to exchanges – she is rarely accompanied for very long – with the orchestra. The other soloists and the choir appear only in the second movement. There is a fastidiousness about this music which seems directly descended from Debussy and Ravel, but the highly organised serial technique creates its own very particular sound world which is, nonetheless, unmistakeably French. The performances, with a particularly challenging part for the chorus, are remarkable. I first heard Penderecki’s Threnody for the Victims of Hiroshima as an impressionable schoolboy taken to a concert by the Hallé Orchestra in the 1960s. The shock of the opening of the work was almost physical and I will never forget it. The players hold, fortissimo, a note as high as possible in the register of the instrument, and the rest of the work is a positive catalogue of avant-garde writing for strings. The work was played just before the interval, as I remember, and then repeated after it, in a programme made up entirely of contemporary works. It stood out from the others, and still retains its power to shock, particularly when heard for the first time. I was a little disappointed to learn that the composer decided on the title only once the work was finished. The performance here is everything one could wish for. The same cannot be said, sadly, for Paavo Järvi’s Bernstein. A disappointing choice for this collection in any case, this suite of dances gives an impression of West Side Story which is quite unbalanced and unrepresentative. The word “symphonic” appears in the work’s title, but these are dance band pieces and, quite simply, the Birmingham players under their Estonian conductor simply do not have what it takes, superbly though they play. Everything is in place, but the music making lacks that vital flexibility, that freedom of rhythm and, above all, that abandon, necessary to communicate the essence of this music. For that, and for something altogether “hotter”, one can do no better than the different readings under the composer himself. Messiaen’s monumental wind and percussion piece Et exspecto resurrectionem mortuorum represents the year 1964. Each of its five movements carries a title in the form or a biblical quotation referring to a particular aspect of the resurrection of Christ. The music itself is sure to be full of symbols relating to these quotations, but I can hear no discernible link. Monstrously overblown and grandiose, ear-splitting in what seems to me more or less arbitrary use of gongs and cymbals – though the final peroration is effective – this seems to me to be lots of “sound and fury”. I’ll leave readers to complete the quotation. The performance has already been available on CD in different guises and seems to be exemplary. Altogether more congenial, to my taste, though I recognise that not everyone will agree, is Birtwistle’s early Tragoedia. The title takes us back to ancient Greece and the original meaning of the title, “Goat-dance”, or the dance of an animal about to be slaughtered for sacrifice. The work is written for chamber ensemble, and is by turns highly dramatic and dissonant and translucently, seductively beautiful. It is an excellent example, however, of the leap of faith necessary for those listeners experienced only in the established classics, in order to appreciate the music of our own times. Still a new piece when recorded in 1965, it receives a stunning performance here from the Melos Ensemble under Lawrence Foster. Henri Dutilleux is an example of that kind of French fastidiousness and self-criticism which makes for a very slim catalogue of works but in which each work is a perfectly honed jewel. Each of the five movements of his cello concerto is headed by a quotation from Baudelaire, as is the work itself. Much of the music is slow moving, but the final movement contains some hair-raising writing. The orchestral writing is astonishingly colourful and accomplished and this is certainly music which, given the necessary openness of mind, should please even those resistant to modern music. This was its first recording and Rostropovich’s playing is simply stunning. Many cellists have taken up this masterpiece in recent years, and several of them have recorded it to notable success. But this is the one to have. I am perhaps one of the few music lovers on the planet who has never heard Dawn Upshaw’s famous recording of Górecki’s Symphony of Sorrowful Songs. Stubbornly (and stupidly) resistant to hype, I deliberately avoided the work when everybody was talking about it, but later invested in the Naxos recording conducted by Antoni Wit to see what all the fuss was about. I find it haunting and moving, with only the excessive sweetness of the lullaby coda a step (slightly) too far. I wonder, too, if it is a symphony in any real sense. The soloist on this performance is the same as on Naxos, Zofia Kilanowicz, and, if such a thing is possible, she is both more ardent yet with more restrained dignity on Naxos than she is here. It remains, however, a ravishingly beautiful voice so well suited to the work that I find it difficult to imagine Dawn Upshaw singing in her place. A few coughs – one on the very first note – plus other noises off betray the live origins of the recording, as does the cathedral acoustic which does no favours to the work, especially the multiple canons deep in the strings in the opening movement. It is a fine performance, however, but for those new to the work, particularly those who are sceptical, the Naxos performance, the only other I have heard, gives a better first impression. Listeners expecting Henze’s Barcarola to be a gentle, lilting portrait of Venice from the composer’s warmer, Italian years will be surprised. The city is here at least as menacing, and as ambiguous, as it is in Britten’s Venice opera of six years earlier. The performance by the Birmingham players and Rattle is a fine one. Each of the last two discs of this remarkable collection is a very mixed affair. Arvo Pärt was bound to appear in a collection such as this one. Spiegel im Spiegel features eight minutes of constant arpeggios sweetly given out by the piano, over which the violin intones its melody. The first phrase of this melody is only two notes long and is followed by its immediate inversion, that is to say, when the original phrase goes up, it is followed by the same phrase but going down. A note is added to the melody each time, and each time it ends on the same note, A. Philip Borg-Wheeler, writing in the booklet of the original, Eminence, incarnation of this performance, talks about “an effect of childlike innocence”. Well, that may be so, but after a couple of minutes one finds oneself able to predict the second phrase of each cycle to the point where you want to scream. And as if one hadn’t already got the point, “Spiegel” is German for “mirror”. Tasmin Little plays with exquisite beauty of tone and Martin Roscoe is to be commended for having so doggedly practised his arpeggios in what must surely be a mind-numbingly boring piece to play. All this is a world away from the exquisite and rather eerie tremolandi and glissandi which make up the first few minutes of Takemitsu’s Water-Ways. This piece was new to me and I was immediately taken by its very particular sound-world, though less convinced by the long, repetitive and hypnotic passage leading to the close. The Chairman Dances, part of John Adams’ opera Nixon in China, is one of the more celebrated pieces of American minimalism - though we should be careful how we apply the term. It’s an engaging piece, real dance music at times and with a Broadway-style big tune that sticks in the mind. Slim stuff, though, all the same. One of the pleasures of reviewing a set like this is that one returns to works one hasn’t heard for a long time. This was the case with The Protecting Veil, and I was curious as to how I was going to react. In the event, what I remembered as a strikingly individual and moving work now seems overlong and lacking inspiration. True, the opening, with its terrifying high-lying sustained phrases, is undeniably beautiful. But the work runs to forty-five minutes, with most of the music slow. The cello writing is largely limited to slow, stepwise melody, with little double stopping, and the string orchestra acts, as the notes to the original Virgin issue state, as a kind of echo chamber to the solo line, in other words, more held chords. There are one or two more forceful passages, but they are short lived, and the mysterious musical tag which links most of the movements and which is finally transformed into the Virgin’s tears in the closing moments of the work now seems contrived and unconvincing. For the less sceptical, Steven Isserlis delivers a performance as stunningly convincing as it is convinced, and Rozhdestvensky and the London Symphony Orchestra strings support him magnificently. The final disc of this remarkable set begins with a surprise name, that of Marcel Landowski. He was brought into the French Ministry of Culture in 1966 to take charge of music, opera and dance and the following year created the Orchestre de Paris. This piece, the first of his music that I have heard, is a mildly anguished piece of post-Romantic writing, using a chromatic but quite tonal musical language. It is billed as a piece for string orchestra, but there is percussion and wind in there too. I have heard it three times and it still seems to me a pretty formless, unmemorable piece of writing. The performance, under the composer, seems competent and committed, but it does seem an odd choice for this collection. Inspired by William Golding’s novel ‘Pincher Martin’, Mark-Anthony Turnage’s Drowned Out is a twenty-two minute orchestral tour de force. Highly dissonant and violent, this music rarely pauses for breath. Many influences can be heard at different points in the work, perhaps most overtly that of Stravinsky, but the language is never derivative, Turnage having succeeded in finding his own voice amidst the multitude of others. It also demonstrates its composer’s masterly control of drama and form. It does not make for easy listening, but approached with an open and receptive mind it is highly rewarding, particularly in a stunningly committed performance such as this one. Schnittke’s Minuet is too short to convey much feeling of the composer, though the dark, baleful opening which is then transformed into a kind of elegant pastiche of a classical minuet is quite typical of him. It’s a pity, though, that it was not possible to include something more substantial by this important figure. The music of Nicholas Maw could scarcely be more different from that of either of these two figures. A pupil of Lennox Berkeley and, later, Nadia Boulanger, he developed a richly romantic means of expression which he never abandoned. Dance Scenes, in four linked movements, was first performed in 1995, having been commissioned to celebrate the one hundredth anniversary of the law firm Rowe and Maw. This really is one for those who are scared of modern music. It is colourful and tuneful, exuberant and brilliantly scored. It is a pleasure to listen to, and the more one listens, the more one hears. It is superbly performed here. As I write this I learn that Nicholas Maw died in Washington DC on 19 May 2009. And so we come to Thomas Adès. Asyla was composed for the City of Birmingham Symphony Orchestra, and this live performance is conducted by Sir Simon Rattle, who has consistently supported and promoted the composer. Its four movements correspond roughly to a symphonic pattern. The title, the word “asylum” in its plural form, is apparently meant to evoke both the notion of safe sanctuary, as in political asylum, and the more usual mental hospital application. I don’t pretend to understand any of that, nor am I able to perceive any link. I find this music cold and lacking in human emotion, a reaction I have to most of this composer’s music, and in this particular work I find the scherzo, subtitled, for some reason, “Ectasio”, profoundly irritating. In spite of the obvious brilliance of the writing and the remarkable mastery of the orchestra the work seems to me a series of empty, even pretentious gestures. This reaction is not the result of laziness on my part, and indeed I intend to persevere with this composer, if only because others find so much more in his music than I do. And then there is the fact that my view of the work corresponds quite closely with many to Britten’s Sinfonia da Requiem of 1940 - and of CD10 in this collection. Time has proved them wrong, and will probably prove me wrong in this case.